UMass Dining Chef Don Sabola (pictured to the left) created the Worcester Herb Garden in 2009 to provide a fresh source of herbs for chefs from right inside the Worcester Dining Commons. 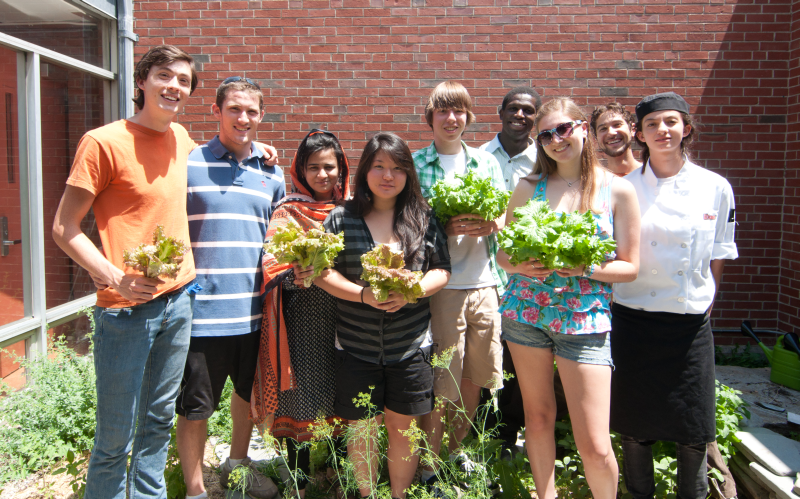 In 2011, the UMass Permaculture Initiative took over the garden to transform and maintain it. Working with UMass Dining staff, we have developed a dynamic herb garden at the Worcester Dining Commons. The site is very unique in that it is completely enclosed within the building. One wall is made of glass, which reflects sunlight back into the site, generating heat, like a greenhouse. The other three walls are brick, a material with very high thermal mass that allows the site to hold on to heat. This creates a warm microclimate within the garden, allowing us to extend our growing season and experiment with subtropical plantings like lemongrass and hardy banana.